The Rapid 1200 roller banner stand is part of our comprehensive range of budget roller banners and offers something a little different. 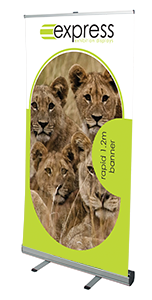 The 1200mm width is bigger than the standard banners which are generally 800-850mm wide. This larger graphic area provides more space to get your messages across. As well as being a cost effective solution to creating a large backdrop, they could also be used as press walls or photography backgrounds for award ceremonies!